Web Content Management System ,Web CMS is a bundled or stand-alone application to create, manage, store and deploy content on Web pages. 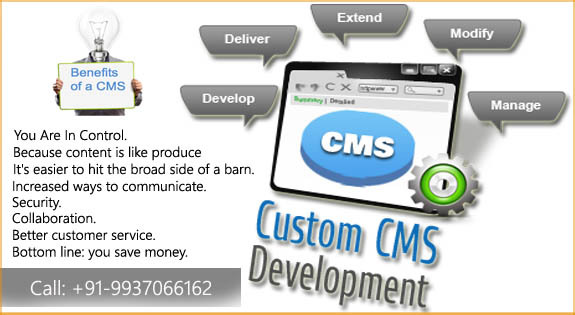 A Content Management System (CMS) is a computer program that allows publishing, editing and modifying content as well as maintenance from a central interface. Such systems of content management provide procedures to manage workflow in a collaborative environment. These procedures can be manual steps or an automated cascade. A web CMS may catalog and index content, select or assemble content at runtime, or deliver content to specific visitors in a requested way, such as other languages. Web CMSs usually allow client control over HTML-based content, files, documents, and web hosting plans based on the system depth and the niche it serves. Our web content management system (WCMS) makes it easy for you to update your website without having to know anything about web development. With just a few clicks you can update articles, upload photos and videos, change the text on your homepage, or add new products to sell on your website. You never know how your site will grow, you might need to add a new section or two to your website. That's not a problem, with very little effort we can easily customize our CMS to update new sections of your website. Imagine when a user comes on to your site to see there is no difference on it since the last time he visited... The chances that he will come back again are grim. You have possibly made several attempts to update your website, but you need to pay a price each time and go through a process of updating with your existing Service Provider. Now would it not be wonderful if you could update your website on your own or assign sections of your website to be updated by designated stakeholders of the site! Web CMS Software Bhubaneswar, Content Managemnt System Website Designing Company Odisha , Web CMS Website Design,Web CMS Software Development,Web CMS Website bhubaneswar,Web CMS Website Development Company,Web CMS,Web CMS Solution,Web CMS webdevelopment odisha,Online Web CMS Website India,Web CMS development Bhubaneswar,Web CMS Designing & Development,Web CMS designing Software Company ,Web CMS Odisha , Web CMS Website Designing Company in Bhubaneswar Odisha India.